It may sound annoying, but growling is an important way of communication for dogs. It's something dog owners should respect and appreciate rather than punish. It is obvious to hear a dog owner say, "What should I do with a dog growling at me? "Your dog may growl when you trim his nails or when he's startled. Don't react too quickly. Growling is not always bad; in fact, your dog uses the technique to tell you about something that's making him uncomfortable. Figuring out what dog growling actually means will help lay the foundation of a successful canine-human relationship. There can be so many reasons why a dog starts growling, and some of them are mentioned below for your understanding. Terrified dogs may growl, and most dogs are always afraid of strangers. A fearful dog growls to warn a stranger – he says, "back off" or face the consequences. Just like a little child who doesn't want to share his/her favorite toy with someone else, a dog may often show unhappiness when you carelessly handle their possessions that could be a rawhide bone, a toy, or even a bowl of food. 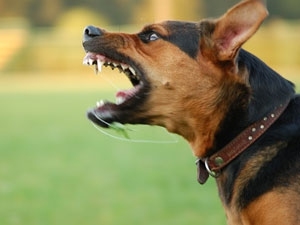 Many dogs growl when they see someone (a stranger) enter their territory. The mailman usually has to witness such growling when they approach the door. A dog may growl at you to make you know that intruders are not welcome here and you're stretching your boundaries a little too much. If you hear your dog growling, don't ignore it. Your dog sometimes growls to express his pain due to an illness or an injury. Of course, you should first check for abovementioned reasons, and if none present, take your dog to a vet for a complete checkup. You need to be calm when you encounter a dog growling over a bone or even lunging at a child. The best thing is to maintain some distance for a while to help your dog recover. This will only work if the dog is on a leash. In case the dog is off leash, you need to stop immediately and never move towards an aggressive dog. If the dog perceives you as a threat, he may even attack and bite you. It is not a good idea to try to dominate an aggressive dog. Relax your body and lower your gaze instead of turning your back and running. You need to interpret the situation well to be able to help your growling dog. They generally growl when they are afraid. Don't yell at them – even reassurance won't work if they're feeling afraid of something. Pamper them and carefully remove them from the situation and take them to a place where they feel secure and comfortable. It is also important to dig deeper into the details and identify what caused your dog to feel terrified in the first place. If dog growling doesn't stop or reoccur, you may want to discuss it with a professional dog trainer to stop this attitude from escalating. Of course, it's easier said than done, but you have to understand that something's bothering a growling dog and it's your responsibility to help him. Even if your dog stops growling after you punish him, this will turn against you in future, as the dog may not warn you about something with growling and may even bite you. Sometimes, a warning growl can save you from getting bitten by your beloved dog. Moreover, growling is an emotional state and you may have to spend more time to correct this issue. Punishing your dog for growling may even lead to more growling and biting as well. It's for the simple reason – an anxious or fearful dog will not respond to punishments and rewards. So, avoid being strict. Suppressing the growls is never a good idea; instead, you need to identify the underlying problem and solve it. The growls may be related to fear, possession aggression, territoriality, or pain. You can judge other situations, but you may need a vet's help to identify what's hurting your dog. You need to talk to an animal behaviorist because fear, possession aggression, and territoriality are behavior problems, and an expert may institute a behavior modification program in an effort to change your dog's opinion about something that's making him to growl. It's true that you shouldn't be yelling at your growling dog, but does this mean you should reward him? Why not? This could be an effective way of making your dog feel less fearful because this approach will make him anticipate safety and food for growling. With this trained growl, you will be able to get rid of that 'warning' growling. That reward will help change the emotional state of your dog. Just remember, rewarding the growl is a strategy that won't always work. While trying to change the emotional state of your dog and making him feel better about something that's upsetting him, don't rush into things. Learn to go slow or else your dog may get overwhelmed and become even aggressive. Don't come too close if you've just started training your dog. Throw him a treat and leave. If he responds positively, only then should you be coming close to him. If these tips don't help and dog's still growling, you may have to take him for a veterinary exam to ensure there are no physical issues present. Sometimes, it's important to consult a dog behaviorist, and that's exactly when you can check a page on our website that answers all your questions and even helps you find the best canine behavior specialists. Keeping an aggressive dog on a leash is important. You should introduce the dog to strangers and children with care. Always spend some time educating yourself about canine body language. Signs like tightening of the mouth, hard stare, tense body posturing and growling usually explain that a dog is close to becoming defensive. Even after all this, things may go wrong. So, what to do if your dog bites you? Go see your doctor to receive medical attention and consult a dog trainer to resolve the issue.